Our Netto practically across the street from us has closed with very little warning (about a week). This is bad news; it means the only grocery store on the island is the Biomarkt next to the Netto. Not that the Biomarkt itself is inherently bad, but the selection is not terribly good and everything there is expensive. One of the things we won’t be able to just stop in and pick up at Netto anymore is frozen bake-it-yourself garlic bread. But then I found this recipe — and maybe that’s a silver lining. This is fast, easy, cheap, and most importantly, tasty. Cut the baguette in half the long way, splitting it open. Cut the halves into serving-sized pieces. In a small bowl, mix butter, olive oil, garlic, oregano, salt and pepper. Spread the mixture evenly on the bread slices. 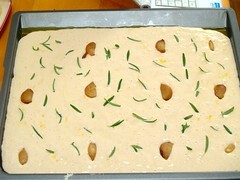 On a medium baking sheet, arrange the slices evenly and broil a few minutes, until slightly brown. Check frequently so they do not burn. Remove from broiler. 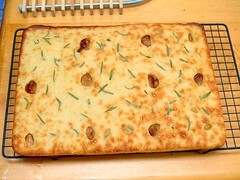 Top with cheese and return to broiler another minute or two, until cheese is slightly brown and melted. Serve at once.